Preliminary Chart of Port Royal Entrance Beaufort Chechessee and Colleton Rivers South Carolina. 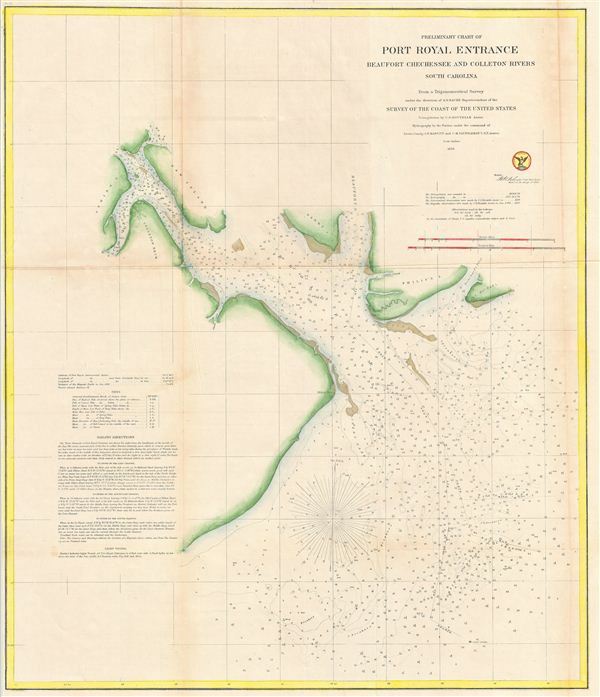 An uncommon example of the 1859 U.S. Coast Survey nautical chart or maritime map of the entrance to Port Royal and Hilton Head. The map covers from Daw Island to St. Michael Island DN from Hilton Head to Parris Island and the Beaufort River. As a nautical map it further includes countless depth soundings (in feet) and a wealth of practical information for the mariner. The triangulation for this map was completed by C. O. Boutelle. The hydrography was accomplished by a team under the command of J. N Maffit and C. M. Fauntleroy. The whole was compiled under the direction of A. D. Bache, one of the U.S. Coast Survey's most influential and prolific superintendents, for issue in the 1859 annual report to Congress. Very good. Some light spotting and toning on original fold lines. Else clean. Backed with archival tissue.